Aromatics, or arenes, are derivatives of benzene or other compounds with aromatic ring systems. That is, they are cyclic, planar, fully conjugated and have an odd number of π-electron pairs. Like alkenes, aromatics have π-electrons that are loosely held and are easily attracted to electrophiles. However, aromatics don't undergo the typical reactions of alkenes. For example, bromine will not add across the double bond of benzene. Instead, a bromine atom replaces one of the hydrogen atoms on the benzene. This reaction is greatly accelerated in the presence of Lewis acids, such as ferric chloride. A similar reaction happens with chlorine. If treated with chlorine gas and a metal catalyst, a chlorine atom from chlorine gas can replace a hydrogen atom on benzene. However, the same thing doesn't work as smoothly with the other halogens, iodine and fluorine. The reactions of chlorine and bromine with benzene and other aromatics can be catalysed by a variety of Lewis acidic metal catalysts. So can the reactions of alkyl halides and acyl halides, which we don't normally think of as electrophiles for alkene addition. There are some limitations on what kind of groups can be added in this way. The carbon attached to the halide should be tetrahedral. Typically, it is much easier to add secondary or tertiary alkyls than primary ones. That is, the carbon attached to the halogen had best be attached to two or three other carbons as well. Methyls are very, very difficult to add in this way. There is an exception. The carbon attached to the halogen need not be tetrahedral, provided it is a carbonyl carbon. That reaction is called an acylation. In these cases, it is the alkyl or acyl, rather than the halogen, that replaces a hydrogen atom on the benzene. Remember, benzene is most likely acting as a nucleophile in this reaction, even though it is following a different pathway than an alkene would. It is reacting with the most electrophilic part of the alkyl halide or acyl halide. Aromatics have a limited repertoire of electrophiles with which they commonly undergo reaction. In addition to these Lewis acid-catalysed reactions, there are also reactions strong acidic media, such as a mixture of nitric and sulfuric acid. Another acidic medium, referred to as "fuming sulfuric acid", is really a mixture of sulfuric acid and sulfur trioxide. Just as with the acid-catalysed reactions, the nitro group and the sulfonate group just replace a hydrogen atom on the benzene ring. The overall reaction involves bond formation between a benzene carbon and the electrophile, and bond cleavage between the same carbon and a proton. 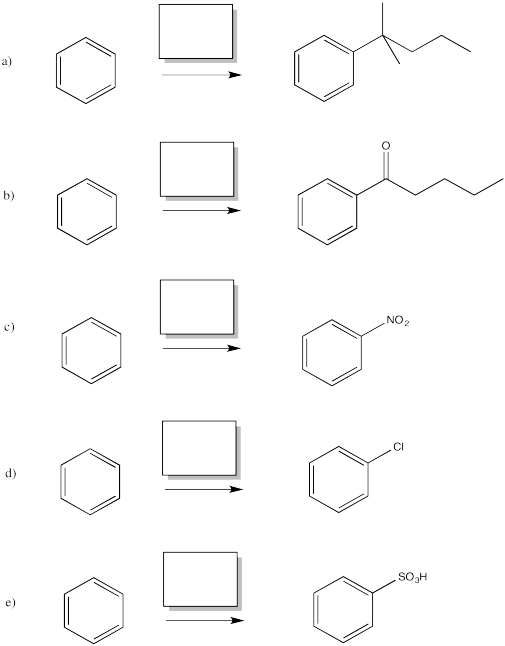 Fill in the missing reagents in the following reactions. Structure & Reactivity in Organic, Biological and Inorganic Chemistry by Chris Schaller is licensed under a Creative Commons Attribution-NonCommercial 3.0 Unported License.